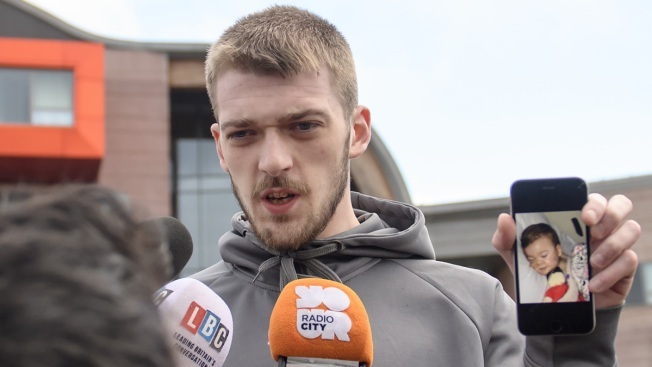 In this April 26, 2018, file photo, Tom Evans, Father of Alfie Evans, holds a photograph of his son as he speaks to media outside Alder Hey Children's Hospital in Liverpool, England. Kate James and Tom Evans made the announcement on social media, saying they were "heartbroken." The death of Alfie, who had a rare degenerative brain condition that left him in a "semi-vegetative state" with almost no brain function, came five days after doctors removed life support. Doctors overseeing Alfie's care in the city of Liverpool said further treatment was futile and not in his best interests, and that he should be allowed to die. But his parents fought for months to try to convince judges to allow them to take him to the Vatican's children's hospital so he could be kept on life support. The parents' campaign was backed by the pope and Christian groups, which helped draw international attention to the case. The hospital withdrew Alfie's life support Monday after a series of court rulings sided with the doctors and blocked further medical treatment. "My gladiator lay down his shield and gained his wings at 02:30," Evans, 21, said in Facebook post decorated with a broken heart and crying emojis. The death came after an easing of tensions between the family and the hospital. Evans had pledged to work with doctors to give his son "dignity and comfort," as he called for a truce in the divisive case. "Our lives have been turned upside down by the intense focus on Alfie and his situation," Evans said Thursday outside Liverpool's Alder Hey Children's Hospital, where Alfie has been treated for more than a year. He thanked the hospital staff "for their dignity and professionalism during what must be an incredibly difficult time for them too." It was a strikingly different tone from the one he struck earlier, when he said doctors were wrong about Alfie's prognosis and threatened to resume his fight in court. Alder Hey issued a statement to express "heartfelt sympathy and condolences to Alfie's family." "All of us feel deeply for Alfie, Kate, Tom and his whole family and our thoughts are with them," the statement said. "This has been a devastating journey for them and we would ask that their privacy and the privacy of staff at Alder Hey is respected." Alfie's case received much attention outside Britain, especially in Catholic countries. Pope Francis, who had met with Evans, appealed for the wishes of the boy's parents to be heeded, saying only God can decide who dies. Italy even granted Alfie citizenship and put a military plane on standby to transport him to Rome if the courts allowed it. Officials in largely Catholic Poland and Italy have implicitly criticized Britain's courts and state-run National Health Service on the case. Supporters prayed for the toddler in St. Peter's Square to show solidarity with his parents, while in Warsaw people placed candles, teddy bears and notes in front of the British embassy. Emotions have run high over the case, with supporters staging angry protests regularly outside the hospital, at times trying to storm its entrance. Alfie's mother, 20-year-old Kate James, posted that she was heartbroken over Alfie's death but added, "thank you everyone for all your support."